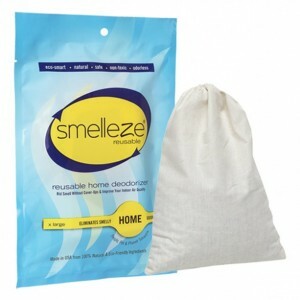 SMELLEZE Natural Moth Ball Smell Deodorizer Granules 25 lb. Bag Sprinkle Generously Summary Smelleze® Eco Moth Ball Smell Remover Granules eliminate moth ball smell without masking with harmful fragrances. Moth ball odor doesn't stand a chance! This eco-friendly moth balls odor removal deodorizer is specially made for eliminating moth ball fumes & odor resulting from improper use. It really works & is safe for people, pets & planet. Features & Benefits • Simply sprinkle & smell the difference • Eliminate moth ball odor instead of masking it • Creates a cleaner, safer, healthier environment • Safe, non-toxic, natural, non-caustic, odorless • Environmentally friendly & non-flammable • Significantly improves indoor air quality • Designed for indoor & outdoor use • Made in USA Rid Moth Ball Smells Now Moth balls are used to kill moths when storing clothing and other items in airtight storage containers. Moth balls are not intended for use outdoors, in crawl spaces, in attics, on floors or carpets, with mattresses or furniture to keep away unwanted animals, rodents, pests, and snakes. Improper use of moth balls, like any other product, can result in problems. Smelleze® Moth Ball Smell Removal Granules & Powder can be effectively used to remove moth ball odor resulting from improper use and for products that don't dissipate naturally and quickly. Smelleze® Moth Ball Odor Removal Granules will remove moth ball smell without masking them with fragrances, complement existing ventilation systems, and create a better environment for your family. For a breath of fresh air, simply sprinkle Smelleze® Moth Ball Smell Neutralizer Granules on floors, carpets, furniture, cabinets, clothing, coaches, and drawers, leave for a few hours or overnight, and clean. It will help remove the moth balls odor quicker. It can also be used safely outdoors in crawl spaces or yard where moth balls were placed. It will eliminate moth ball odor from the soil faster and prevent it from entering the home and plants. 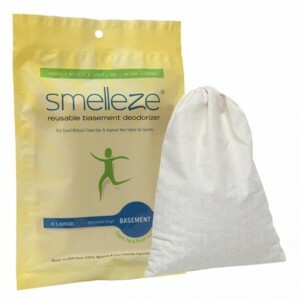 Smelleze® Moth Ball Odor Neutralizer Granules are a non-toxic, safe, recyclable, natural, odorless, non-flammable and non-caustic moth ball odor removal product. 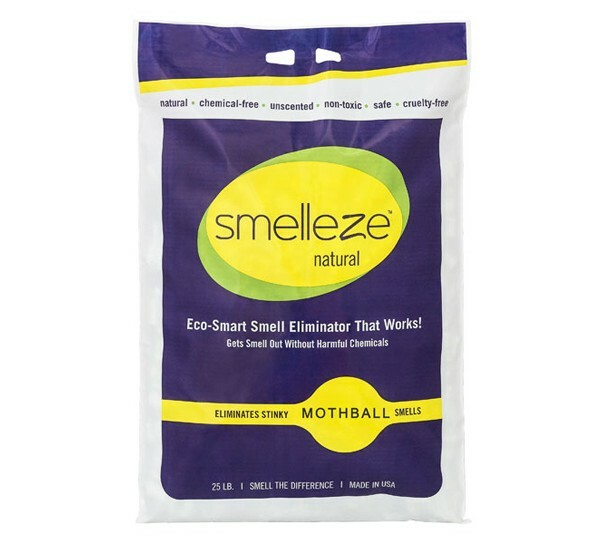 Smelleze® Moth Ball Smell Remover Granules are an ideal environmentally friendly solution to remove moth ball odor without adding pollutants to the air you breathe. It does not contain VOCs, harmful or ozone depleting chemicals and is especially beneficial for those suffering from allergies and chemical sensitivity. No fossil fuels are used in the production of Smelleze® moth ball smell eliminator media. DISCLAIMER: Please refer to the manufacturer's instructions for proper and safe use of their moth ball repellent products. Use of Smelleze® Moth Ball Odor Remover Granules will NOT expand the range of approved uses of moth balls by the manufacturer and render such uses safe. It only for helping to eliminate moth ball odors faster due to improper use and for products that do not dissipate naturally and quickly once moth balls evaporate or are removed from the item or area. IMTEK is not associated with any moth ball manufacturer.